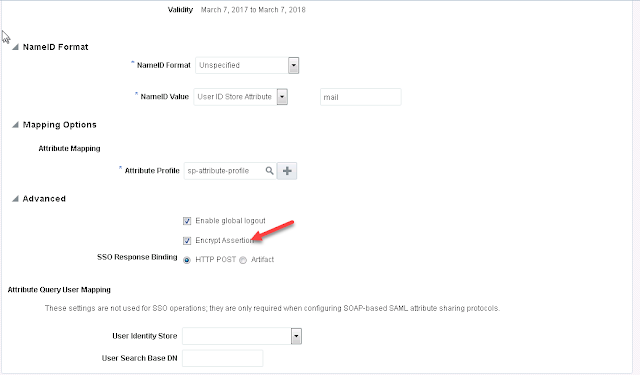 Today we are going to learn about the configurations required to enable encrypted SAML communication between IDP and SP. 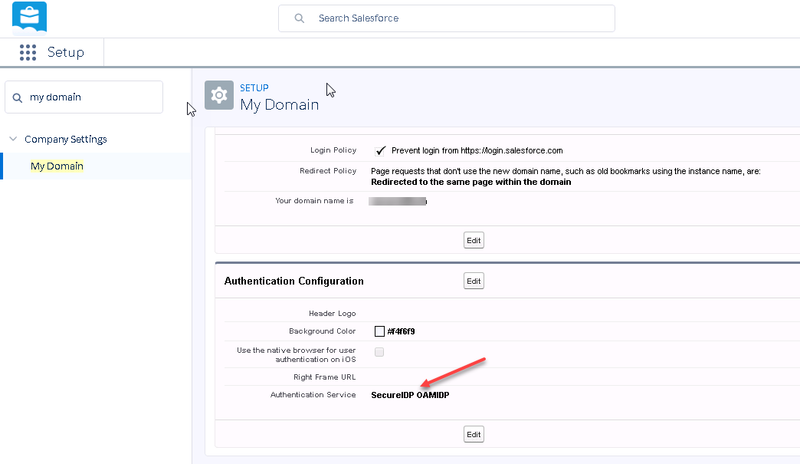 In my earlier posts, I have covered about SSO configurations and couple of other scenarios in Federated SSO by taking Salesforce as example. You can refer to my earlier posts for more information. This post specifically covers about configuration required to enable Encryption of SAML Assertion. Assuming we already have configured SSO to Service Provider application in SP Initiated mode which is Salesforce in our example. In this post, we are going to use the Self-Signed Certificate that can be generated inside Salesforce. In real environments, we usually get these certificates signed by third party certificate authority. 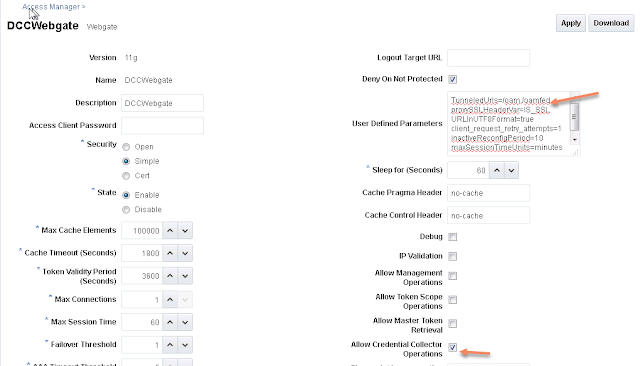 Once the certificate is created, Lets configure the IDP Profile to configure the encryption settings. If you compare this latest downloaded metadata with earlier, this will have additional information about the encryption information. Save the changes made to this service provide profile. Ok. We are now finished with the configuration changes. Let's validate the Encryption now. 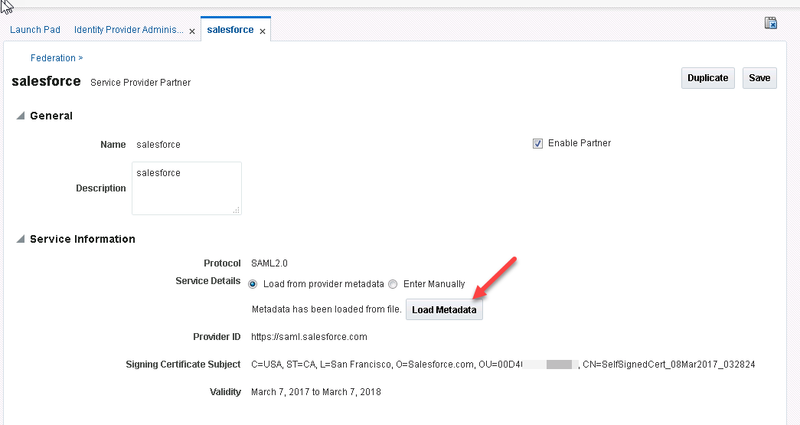 Access the Salesforce application using the SP initiated URL. Once the authentication is successful, OIF engine generates SAML Response in encrypted manner as shown below. You can view this SAML messages using the browser plugins. Once the Assertion is successfully decrypted and validated by Salesforce, you will be landed into your Salesforce domain. Receiving the "404 NOT FOUND" error while accessing the /oam, /oamfed resources or oam based resources through DCC (Detached credential collector) Webgate enabled webserver and shows no error logs on webserver except in access logs as 404. This is due to missing configuration in the webgate. Need to add the list tunneled URLs explicitly that need to be served by DCC Webgate. Restart the webserver and try again. For more information regarding dcc implementations with federation, Please refer to my earlier posts on the OAM DCC configuration settings. OUD Instances Out of Sync ?? In the world of replication between nodes across data centers, there are chances of having some node failures due to power outages, disk issues or for several other reasons. These issue might result in the data going out of sync between the nodes. Below are the high level steps which we are going to take in order to fix this data inconsistency. Find the OUD server which is stable. In this post, referring as oud1 in the post. Find the OUD server which is out of sync with stable server. refering as oud2. Run below ldapserach command to write entries into file. by default ldapsearch utility will be available in <oud_instance>/bin folder. Here OUD1 is the best instance and OUD2 is the instance which is out of sync. P.S: When you open a file it might look empty but please scroll down and verify entries are available. Use below command to diff to compare the files and write the missing entries into a file. Use grep or other tools to remove first two lines (dn:) in missing_entries.txt and sample file should looks like below. Export ldif data (with attributes) from oud1 for the missing entires. create export_missing_dn.sh file and update the content with below. Run export_missing_dn.sh, it should create a file with name, export_missing_dns.ldif. Open the file and make sure there format of ldif is correct before importing. That's all. Now your instances are in sync..